See You at Second Horses, Barclay Rives, Aterlerix Press, New York, 2014, Paperback, illustrated, 184 pages, $13.50, available at retail outlets including Horse Country Saddlery, Warrenton, VirginiaThe foxes! Oh, the foxes! When Barclay Rives undertook a marathon of foxhunting in 1999, when he went out with nine English hunts in ten days, it seemed like there was a fox popping out of every covert. 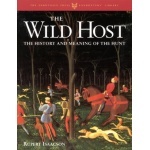 Rives, an honorary whipper-in for the Keswick and Bull Run Hunts (VA), writes about his English sporting adventure in See You at Second Horses, a delightful read that puts us galloping behind some great packs in the glory days before the infamous Hunting Act of 2004 banned hunting with hounds in the traditional manner in England and Wales. Rives is an avid hunter who once hunted one hundred days a season, sometimes going out with Keswick in the morning and Bull Run in the afternoon. Saying he was gung-ho is an understatement. He jumped at the chance to join his friends Grosvenor and Rosie Merle-Smith to hunt with packs dating back to the 1700s: the Quorn (twice), the Cottesmore, the Fernie, and others, including a foot pack—the High Peak Harriers—after rabbits. Grand Champion Wentworth Audrey 2013, shown by huntsman Kami Wolk, MFH / Eric Schneider photo Wentworth Audrey 2013 was judged Grand Champion of Show at the New England Hound Show on Sunday, May 4, 2014. 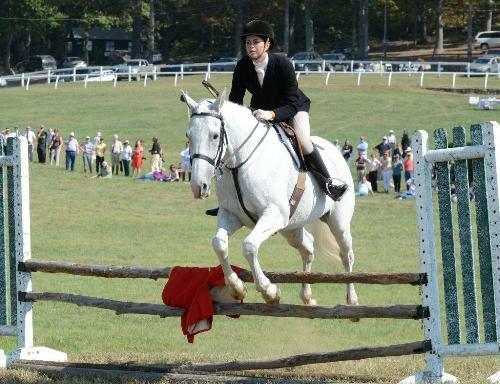 The show was held at Echo Ridge Farm in Lee, New Hampshire and was hosted for the first time by the Wentworth Hunt. Audrey is by a Penn-Marydel sire, Red Mountain Van Gogh 2008, out of an American dam, Keswick Nipper 2010. Audrey's sire, Van Gogh, has his own history. After a couple of stops in the Carolinas, his intelligence earned him a new home in New England where he could hobnob with all the Ivy Leaguers. More on that later. Huntsman Charles Montgomery from the Bull Run Hunt (VA) judged the foxhounds. Montgomery knows a good hound when he sees one. As huntsman for the Live Oak Hounds (FL) for many years, he consistently fielded a pack of hounds of which an astounding percentage were hound show Champions and Grand Champions. Wentworth is a drag pack in southern New Hampshire that changed over from Crossbred hounds to American and Penn-Marydel when the current huntsman Kami Wolk, MFH, took up the horn. Kami explained that Audrey was one of two litter sisters that huntsman David Raley drafted to her from the Moore County Hounds (NC). David, in turn, had received the pair from Katherine Gunter, huntsman at the Aiken Hounds (SC) who bred the litter. Huntsman Robert Taylor hasn’t had a good rest in five years. 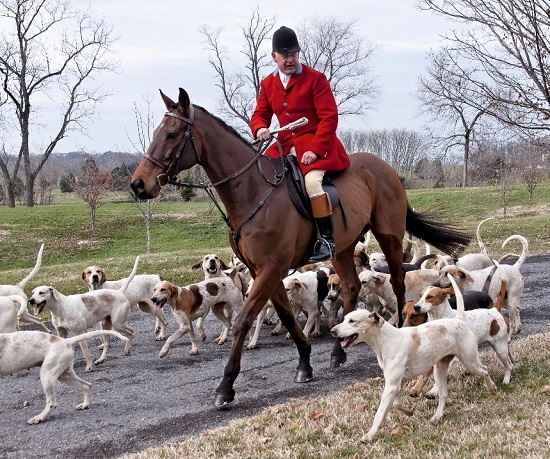 He’s been hunting two separate packs of foxhounds in Maryland—the Goshen Hounds as Master and amateur huntsman and the New Market-Middletown Valley Hounds as professional huntsman. Huntsman Ken George has been driving hounds and horses six hours each way twice a week from Kansas to Iowa to hunt hounds in both states. Huntsmen love what they do, but each season ends with changes in the wind. As this hunting season draws to a close, we see huntsmen on the move again. Starting in the north and progressing southward then west, here’s what we know so far; please let us know who we’ve left out. “We have arranged to have ten coyotes on standby for your hunting pleasure today,” announced Joint-MFH Charlie Lewis as he welcomed guests to the opening meet of Belle Meade’s “Gone Away with the Wind” Hunt Week. It was Monday, January 27, 2014 in Thomson, Georgia. The footing was perfect and the sun was shining. The following day it snowed, closing schools, paralyzing the Atlanta area, and prompting the governor to declare a state of emergency. The Belle Meade hosts were resilient, however, improvising substitute activities for members and guests for the very few events that had to be modified. Hunt Week guests had come from the Blue Ridge Hunt (VA), Bull Run Hunt (VA), Golden’s Bridge Hounds (NY), Marlborough Hunt (MD), Millbrook Hunt (NY), Montreal Hunt (PQ), Moore County Hounds (NC), the Potomac Hunt (MD), Toronto and North York Hunt (ON), and the Whiskey Road Hounds (SC). The Belle Meade hounds typically meet at three o’clock in the afternoon. In the warmish environs of north Georgia, Senior Master and huntsman Epp Wilson likes to hunt as temperatures are dropping and scent is improving. Of course it often results in riders hacking back in the dark, and even jumping fences after sunset—an adventure in its own right for many followers! Blistering hot weather visited Virginia for the past four weeks. While not unusual this time of year, the length of the hot spell, with temperatures hovering in the high eighties and even reaching into the low nineties, has proved miserable to man and beast alike, but it failed to deter foxhunters who entered this year's North American Field Hunter Championships. On Monday, September 30, the Championships began at Keswick. Hounds met at Glenwood, a fixture in the neighborhood of James Madison's Montpelier, outside the town of Orange. Contestants from as far away as Florida and Georgia traveled to compete in the event, as well as to enjoy early autumn hunting in Virginia. They were not disappointed. Keswick huntsman Tony Gammell provided a fine day of sport in the lovely rolling countryside as hounds ran across the nearby road, back again, and beyond the fixture into a scenic expanse of woods and cornfields. Afterward, everyone enjoyed a tailgate as five contestants were selected for the finals. On Tuesday, October 1, hounds met at Owl Run Farm in Warrenton, home of Casanova Hunt Joint-Master Mrs. Joyce Fendley. Previously the home of Donna and Jack Eicher, huntsman at Rombout and later Farmington Hunt, the grounds include a lake and a cluster of graceful weeping willows out front. The residence and barns all exude the charm of old Virginia Hunt Country—weathered stone, stout board and batten, low eaves and metal roofs. A special surprise awaited the field this morning when shortly after casting hounds, an eruption in a cornfield revealed that hounds had encountered a black bear! Fortunately, the pack obeyed their orders to ignore the bear as it beat a hasty retreat. The remainder of the morning proved quieter, and as the field hacked in, Mrs. Fendley positioned herself, as she always does at the end of a hunt, such that she could personally thank everyone in the field as they passed by on their way to their trailer. This small but thoughtful act is just one of many that make hunting in Virginia so special and unique. It was a hot, thirsty, and tired field that gathered under a tent to drink and devour a delicious crab dip while recalling the excitement of having gone on their first bear hunt! This morning, six finalists were announced.